London Art News: Yanks Ban Scrotum! Ting! First we had Christian and Muslim nutters banning Harry Potter from library shelves in the USA, because they feared it would encourage witchcraft and ungodliness among children, while in Britain the Harry Potter books received critical acclaim from the outset and they have become a huge, worldwide success. 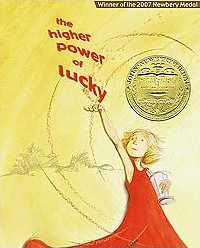 Now the same nutters are banning Susan Patron's The Higher Power of Lucky, which won the prestigious Newbery Medal for children's fiction! And all because of the word "scrotum"! It's in the dictionary, you plonkers. It describes a normal piece of male anatomy (a dog's in this case). I thought American schools were supposed to be secular. Obviously not, when religious prudes run school libraries and can ban award-winning children's novels. Land of the Free? You're joking. Land of the Prude, more like it.